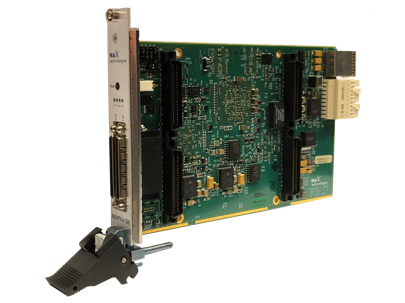 The MAXPXIe 500 carrier board is a high performance, modular multi-protocol PXI Express solution to your tests and simulation requirements, supporting one or two MAX Technologies mezzanine I/O modules. It is powered by a 800MHz RISC processor and 16 MB of shared memory, permitting it to buffer and process communication with the host computer. The on-board firmware allows scheduling of transmit messages, bridging between protocols, complex label filtering, and triggering of recordings. Received messages are time-tagged with 32-bit or 64-bit sub-microsecond precision, without requiring real-time intervention from the host system. Furthermore, multiple carrier boards can be time-synchronized resulting in unmatched precision in critical real-time applications. The MAXPXIe 500 is complemented by MAX Technologies’ mezzanine I/O modules available for ARINC 429/561/568/629/708/717, ASYNC RS-232/422/485, CSDB, ASCB, HDLC/SDLC, MIL-STD-1553, Pulse/Frequency generator, Analog and Discrete I/O and more. Moreover, multiple protocols can be implemented and run simultaneously on a single MAXPXIe 500 carrier board and all the data transferred is time-synchronized, even between multiple protocols and multiple boards. MAXIM addresses the need for various test & measurement solutions that engineers and technicians can easily use and customize to fit their specific requirements. MAXIM provides multi-protocol support in a single, powerful and easy-to-use software. 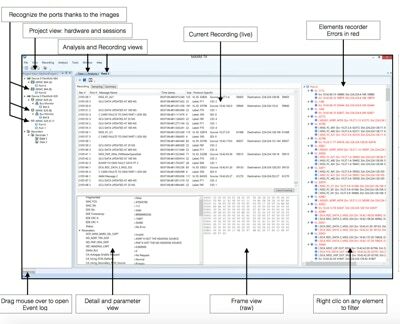 With MAXIM, there is no need to buy, learn and maintain several different simulation and analysis software solutions. Whether your project involves designing, validation, manufacturing, simulation, testing, maintenance, certification or any other process, you need an integrated and flexible solution. MAXIM’s “project-based” environment is easy-to-use and ready for expansion to support a variety of T&M communication protocols and legacy I/O.